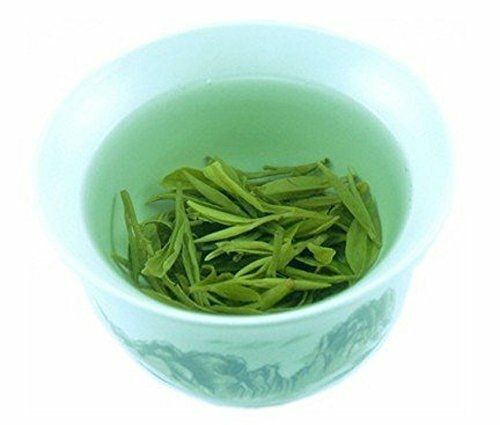 Long Jing green tea, also called Dragon Well green tea, is a special green tea. Leaves are only the tender leaves plucked from tea tree and are dried and compressed into flat shape. This tea has a very distinguished shape and tea consumers will recognize it's fine quality upon sight. Its leaves are broad and flat, a result of laborious drying. There is something to show for this hard work: Dragon Well tea is refreshingly smooth, sweet and delicate, among the very best of Chinese green tea. Green tea is from famous tea town of Yunnan province of China. Green tea has many good effects. It can help to improve your health, such as to help you lose weight, remove toxins in human body, help to refresh, lower cholesterol level in human body, and other effect like Thermogenic Effects, natural antioxidant that helps maintain healthy metabolism and help to Boost human immunity system. Natural tea maybe different from each others, it may not be all the same as photos. Packing maybe changed later and not the same as what is shown on photos. ATTENTION: We refuse any refund and return if below cases happens: 1: Wrong mailing address, receiver name or phone number. Item is forced to ship back to China. 2: The receiver's country Customs refuse to allow item to be shipped to receiver. Item is forced to ship back to China. 3: The receiver's local post office and postman refuse to send item to receiver. Item is forced to ship back to China. 4: Item is refused by buyer, or receiver is not at home, so item can not received by receiver, or item is damaged by receiver or your local post office. Or any other cases that cause item to be damaged or refused by receiver side.